Take your playing up a notch! 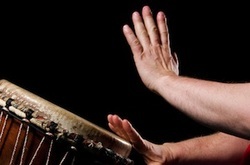 Learn bass drum rhythms and variations that go with your djembe patterns. Develop your solo abilities through traditional phrases and calls. Learn how to improvise on hand drums.